With several locations around the downtown core, Dark Horse offers the basics of the modern cafe – great coffee, good food, reliable WiFi and a space for you to get comfy reading the paper. With its industrial design, and big windows to let in the daylight, this coffee shop hotspot brings together the perfect mixture of rustic charm and modern warmth. 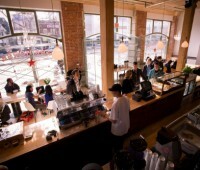 The baristas are friendly, the food is prepared fresh, and the espresso, well, it’s too good to pass up. This entry was posted in shop and tagged bar, coffee, dark, Espresso, horse, toronto on May 8, 2013 by norempli.